The Edgell Supporters are proud to present their first interview. RSL Ben was kind enough to take time out of his busy day to answer our questions, even after waking up at 4am for work. DCU Ben: Let me start with the obvious, as co founder of the Ben Cup, Why? Where? Who? How? What? RSL Ben: The Ben Cup is a (soon to be) premier rivalry in the MLS between Real Salt Lake and DC United. It was started as a result of a rivalry between two friends named Ben, one who roots for RSL and the other for DCU (obviously).The title is decided by the results of competitive (non-preseason) matches between the teams. RSL won the inaugural Ben Cup in 2006. DCU Ben: What does it mean to have the Ben Cup as the first trophy in the RSL case? RSL Ben: It means a lot, considering the complete ineptitude this team seems to display on a weekly basis. I find it amusing personally that the one title RSL has won is against MLS's most prestigious team. DCU Ben: What does the trophy look like? RSL Ben: The final trophy design is still being debated and thought out so right now the Ben Cup winner is solely a title provided in name only. This will hopefully be rectified soon. DCU Ben: Where is it living now? DCU Ben: When you have to send it to me after the second leg, who will pay for shipping? DCU Ben: I know the second leg is not until September 12, but shouldn't I just pick up the cup when I'm in Utah in August? RSL Ben: You can feel free to, us Utahns are a friendly people, we'd be glad to let you look at it for fun until 9/12 when you will obviously have to give it back to the rightful owners. DCU Ben: Do you think that having 3 members of the losing Ben Cup squad from last year (Adu, Rimando, Eskandarian) will help or hurt your chances this year? DCU Ben: I noticed that "MLS" joined the Ben Cup group on Myspace, does this mean the MLS might officially recognize the Ben Cup? RSL Ben: If they are smart they will. They don't want to miss the boat on this one! DCU Ben: How can we notify the participating organizations of their involvement in the Ben Cup? RSL Ben: Once we get the trophy and such finalized I hope to notify the RSL supporters groups as well as shoot off an email to the front office (if they have bothered to hire anyone yet) to let them know. DCU Ben: What is your prediction for the first leg? Any more Free Tibet chanting (thanks kali)? RSL Ben: Well, I'm just hoping that RSL can get their first (and the way they are playing currently, only) win of the season on the 23rd. It'd be a solid b-day present for me. I'm thinking DCU will be overlooking RSL in this one, that bodes well for the boys in red. No Tibet chanting this time, the Peoples Republic of Rice Eccles will see to that. DCU Ben: Where do you see the Ben Cup going in the future? Corporate sponsorships? DCU Ben: When do we start flying back and forth for every leg? Losing team from previous year pays? RSL Ben: When I have a job that actually pays me enough to live on plus enough for plane tix. 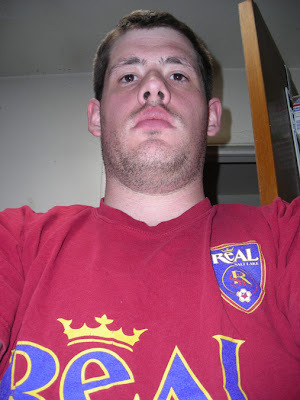 RSL Ben: Don't worry too much, United fans, about clearing a spot for the Cup. We'll keep it safe here for at least another year. (But in seriousness, I'm rooting for ya in non-Ben Cup games). DCU Ben: Thanks for your participation in this interview. In all seriousness we wish RSL the best of luck and hope they do start winning, just not this week. So-predictions for the Ben Cup? those will come tomorrow or friday. make sure you read, you'll want to see what i have to say. Maybe Bobby Boswell could interview Ben Olsen on his site to see what he thinks about it? Olsen really likes giving him long interviews. Seriously, I am now officially excited for Saturday knowing a Cup is involved. I've even added it to my sidebar. Wait, the Ben Cup count should be even, as DCU beat RSL twice in RSL's first season. So, DCU and RSL each have a Ben Cup. it would be nice if DCU could claim a Ben Cup already, unfortunately, due to my late arrival (2006) to the MLS and DCU, last year was the first year of its existence.